Are you our next Sprukestar? Enter our fabulous open mic contest in the run up to SPRUKE 2019. Our festival is all about making and sharing music and here’s an opportunity for all the ukulele players out there to do just that. We want any act as long as you play ukulele- solos, groups, adults or kids. The winner of every round will be chosen by the most votes from our jam audiences. 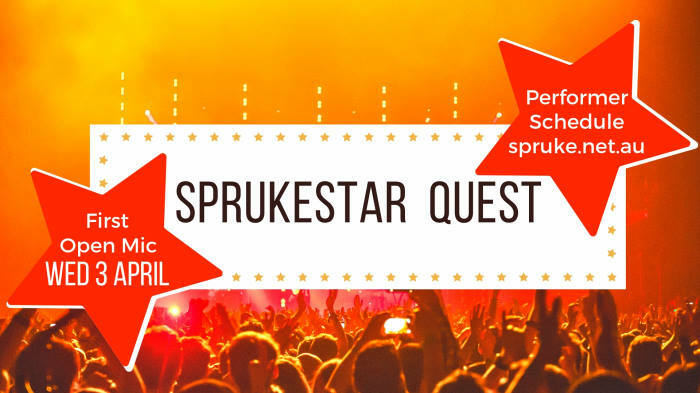 Enter the draw for one of 20 open mic spots in the Sprukestar Quest contest. Progress through the rounds, and you could win a gig in the SPRUKE 2019 Festival Finale Concert on Sunday 15 September 2019 at Sunnybank Performing Arts Complex (SunPAC). The winning act will also receive a $500 Gift Voucher and the runner up act a $250 Gift Voucher. The contest is a series of 2 rounds and a monthly decider held in March, April, May, June, and July- a total of 20 open mic in 10 rounds. Two semi finals and a final held in August. The rounds will be held at the Coorparoo Jam, The Ferny Grove Jam and the Northside Jam according to the schedule which you can download as a PDF here. Even if you don’t enter there’ll be so many great performances to enjoy and vote for. There is a random draw of the twenty (open mic) performance spots for the 10 rounds. In addition there is one random wildcard draw into semi-final 2 from all the entries not through to the semi-final rounds. The winner of each round, monthly decider and semi-final (refer to schedule) will be chosen by the audience who will vote for their preferred performance on the night. The votes will be tallied and announced at the end of that jam. The Final will be held at Northside Jam on Tuesday 23 August 2019. The winner will be decided by the audience but to keep you in suspense we will not announce the winner until the festival. The Finalists will be invited to perform again at SPRUKE 2019 Festival Finale Concert on Sunday 15 September 2019 at SunPAC, where the winner will be announced and the prizes awarded. We hope you’ll be there to cheer your favourite act on. • The contest is open to ukulele players resident in Australia who can be present for the performance schedule. There is no age limit. • If an entrant is under the age of eighteen (18), a parent/guardian must enter the Contest on their behalf. • Only one entry per entrant will be accepted. • Acts must have no more than 10 performers. • Acts must perform the same song through the whole contest. • Songs performed must be family friendly and no longer than five minutes in duration. • Ukuleles of any sort can be played, no other instruments accepted. • No backing tracks, live music only. • Read the Terms and Conditions. • Make sure you can commit to the performance schedule. Download PDF. • Get a photo of your act. Entrants will be required to provide a photograph of the entrant/act with his/her ukulele for publicity purposes: GIF/JPG/PNG image files accepted. Landscape orientation. File size less than 1MB. • Complete the Entry Form with your personal details, and photo. • Performers under the age of eighteen (18), download the “Minors Media Consent Form” sign and return via mediamanager@brisbaneukulele.com by Friday 22 February 2019. Now get all your friends and family to come and support you during your Sprukestar Quest!